Cutbacks to in-house education and leadership development programs mean many companies are relying on the nation’s schools to deliver graduates who are ready to fill leadership roles. Yet on March 9, 2011, the Los Angeles Times reported the Obama administration said 82 percent of American schools fail to teach curricula that imbue students with the skills leadership demands. Consequently, it is left to corporations and their learning leaders to bridge this performance gap in American education and head off the talent pipeline threat. When parents, politicians and pundits bemoan the state of education in America, they often ask the shorthand question, “Why can’t Johnny read?” But generally speaking, that’s not the problem with the workforce. Even with an inadequate educational system, the “Johnnys” who reach the workforce have the three R’s down. They can read, write and do arithmetic well enough to perform their jobs. But the modern workplace has a much higher threshold for success. In today’s world, proficiency in the three R’s is not sufficient without the abilities to think critically, solve problems creatively, collaborate and communicate effectively. It is in these skill areas that new American workers come up short, regardless of the quality of their educations. • Critical thinking and problem solving: the ability to make decisions, solve problems and take actions as appropriate. • Effective communication: the ability to synthesize and transmit ideas in written and oral forms. • Collaboration and team building: the ability to work effectively with others, including those from diverse groups and with opposing points of view. • Creativity and innovation: the ability to see what’s not there and make something happen. According to the study findings, effective communication is paramount, edging out even critical thinking, collaboration/team building and creativity and innovation as competencies that are increasingly essential in a fast-paced economy. 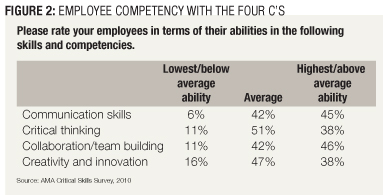 Employees must be able to execute the Four C’s effectively at every level in the organization. Communication isn’t just speaking or writing well. To be an effective communicator, an individual has to think clearly, understand what’s key and express it persuasively. In fact, communication is recognized as a vital component of leadership in the global economy, which is another reason it’s top of mind in today’s organizations. The survey revealed that employers are finding the workforce does not possess this mix of skills (Figure 2), and as a result cannot do the jobs an increasingly competitive and innovation-based global business environment demands. Bridging this performance gap in American education is a challenge organizations will have to face head on in the coming years or risk losing their competitive edge. The gap is one that must be addressed at all levels of business, but particularly at the leadership level, because without the Four C’s, the pipeline is in jeopardy. The survey found employers have begun assessing workers in the four critical skills with regard to leadership development/potential, talent management and succession planning. But even below management level, those employees who don’t develop the Four C’s will find themselves left behind, as will companies that don’t make attaining them a priority. According to the AMA survey, top executives believe it is time for the educational system to fuse the Four C’s with the Three R’s to develop students who are better prepared to enter the workforce. But while that solution might address the workforce of tomorrow, it does not retool today’s workforce. Does business have the time and expertise to tackle what the educational system is failing to deliver? The obvious answer, despite the efforts of learning and development departments, is no. Organizations are responsible primarily for performing their core functions. They have neither the time nor the expertise to address every educational need. “In the training industry, outsourcing is absolutely necessary to be successful,” said Josh Bersin, CEO and president of research firm Bersin & Associates. To bridge the education gap, business will have to team up with independent development organizations to develop a learning culture, which includes wholesale instruction in and development of the Four C’s. According to Bersin, a culture of learning “is the collective set of practices and management behaviors that allows the company or the organization to adapt and learn.” Failure to develop such a culture can lead to disastrous results, which Bersin illustrated using Nokia, which until the advent of the BlackBerry, iPhone and Android operating system, was the 800-pound gorilla of the cellular phone industry, with nearly a 40 percent share of the market. Now, Nokia is in danger of becoming an also-ran — its share has dipped to roughly 31 percent during the past two years — and may soon be a footnote in the history of one of the greatest technological shifts of our time, according to a Jan. 27, 2011, article on Engadget.com. “Nokia had a touch-screen cellphone three to four years before Apple. But it didn’t get out of development, and the reason it didn’t get out of development was because Nokia’s culture did not support the development of new ideas and the continuous learning that [would encourage its] engineers to learn about the new kind of cellphones,” Bersin said. Basically, they were so invested in the old user interfaces they didn’t notice the earth shifting under their feet. Would anything have averted this problem for Nokia? Perhaps leadership that encouraged a culture of learning which would result in a workforce focused on the Four C’s. But that is almost circular reasoning — for leadership to encourage such a culture the leaders and leaders-in-training must be students of the Four C’s as well. The fact that Nokia is not an American company — it is headquartered in Finland — drives the point that the need for these skills is a global phenomenon required by companies that seek to excel in today’s business world. Also clear is that these competencies are simply not taught — not in schools, colleges or graduate programs. Forward-looking companies are doing their best to teach these skills internally and via outsourcing (Figure 3). These organizations can expect their leadership pipelines to be more robust and fluid and their workforces to be more innovative and flexible, thus able to deal with sudden change. Consider Apple. Before his death, the much publicized departure of CEO Steve Jobs demonstrated the organization’s preparedness for change as Chief Operating Officer Tim Cook stepped in to handle the day-to-day operations. Apple didn’t miss a beat, either in leadership or in performance. Most organizations are far from being as well prepared for sudden change as Apple. Instead, their leadership pipelines are running dry, their workforces are not nimble enough to transition through sudden change, and they have failed to instill the Four C’s on an organization-wide basis. This sort of developmental failure is every bit as disturbing as a graduating class not competent in the Three R’s. No company would abide such a workforce, but many willfully accept a workforce that knows little of the Four C’s. In such organizations, when there are unplanned changes at upper levels of management, the all too common outcome is chaos or paralysis reflected by a lack of continuity in product innovation, inconsistent service and customer defections, and the lengthy ramp up before a new hire is functioning effectively and making positive contributions. This is where most of a firm’s productivity is generated and where unplanned turnover is prohibitive. Morale and engagement take a hit and the malaise hurts creativity, productivity and performance. Organizations that develop their people have more success across all performance metrics. According to AMA’s 2011 report “Developing Successful Global Leaders,” 12 percent of high-performing organizations spend at least one-quarter of their annual budgets on global leadership development. Sixty-two percent of low-performing companies spend less than 10 percent of their budget. High performance is defined by market share, revenue, profitability and customer satisfaction. Educational investments should be targeted to the Four C’s. Organizations need to address them across the enterprise to achieve the right kind of results and to have a leadership pipeline that guarantees those results in the future. Everyone in an organization should be skilled in these areas. Without them, an organization is jeopardizing not only its business edge, it’s taking a chance on its very survival. Sandi Edwards is senior vice president at AMA Enterprise. She can be reached at editor@CLOmedia.com.